Discussion in 'General Discussion' started by beaker, May 4, 2004. And the doggone thing was leakin’. But (although I’ve forgotten a few little details, such as, oh... what it was called! ), there was one live puppet show presented for children that really stuck in my mind because it was so twisted. But then, I was a twisted kid, so I went for that sort of thing. This particular show featured a salesman demonstrating a vacuum cleaner that not only moved on its own, but also sang Johnny Mathis tunes. The lady of the house asked how much it cost, and he replied, “Your first born child.” Before he told her he was just kidding, she readily agreed to this price and called her little boy into the room. The main storyline, though, was about a germ that started off germ-sized but kept growing and growing and GROWING until finally it was a person in a giant furry dark germ costume who lumbered out from behind the stage. I remember a lot of children in the audience who (a) were younger than I was, (b) sat closer to the stage, and (c) are probably still in therapy to this day. Does anyone, by some chance, know anything more about this hallucination-in-the-felt from the early- to mid- 1980s? (This was in northern West Virginia; I don’t know if the group, whoever they were, toured nationally.) (Or, have you seen and loved any other puppet kiddie shows that made it seem like the people in charge were born in the Land of Gorch?) I’m really curious. I’m still a twisted kid. Only non-henson thing I watched was "Allegra's Window" and Weinerville or something like that. And that Stick Guy who used to be on Nickelodeon. German Muppet-ripoff show "Hallo Spencer"! ......Hey, I just realized that's probably where my subconscience got the name for my company, www.puppetsnstuff.com. Very interesting. heh cool. Pretty expensive though. My favorite non-henson puppet shows while growing up were mister rogers neighborhood and weinerville. more recently, my favorites are Cousin Skeeter and Greg the Bunny. Let's get a campain going! I've always had a special place for "The Great Bong" (and no, it's not to do with a certain plant-smoking device - LOL). It was a show overseas (I wish it were available over here!) that a certain former-Hensonite...Karen Prell, helmed along with her husband, Mike (as far as I can remember). Great, great show! I just wish it would come over to the States...that and I wish I could remember more about it...oh well...great, great, great! That's my pick. Well hello there, Mike! Pleased to see you're on. I managed to see "The Great Bong" when I was over seeing relatives on a jaunt back to England when it was on. Loved that show, I did. Wouldn't mind it if you did get to re-issue I might say. Wouldn't mind it one bit. I'd be interested to know how you guys managed to finance and pull off such a great piece of work. Loved ALF. Does Fireball XL5, Stingray and Thunderbirds count? Loved those too. I loved Today's Special, Sharon, Lois & Bram's Elephant Show, Under the Umbrella Tree was cool, and Eureeka's Castle. My most favorite puppet programs outside the JHC were Eureeka's Castle and The Puzzle Place (btw LOVE the puppet designs, if I wanted to design a human like puppet, this show would be my biggest inspiration since they did it so well and cute). Of course there was also Allegra's Window, Lamb Chop, etc. 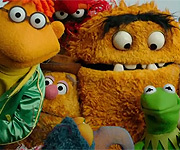 It was also cool that some of these shows had Muppet connections as well such as puppeteers and such. I thought think I watched these a lot but I saw bits and peices of The Puzzle Place and Alleghra's Window when my sister's would watch it. I also remember absolutely loving this one show that I'm pretty sure had a puppet in it but I can't remember what it was called. I kinda remember it being something like a cross between Mister Rogers and Fraggle rock. There was a human host who played guitar and a puppet co-host that always bantered with him. The only clear memory I have of it is one episode where the human talked about how blowing bubbles are made of soap. Doea anyone know what I'm talking about? My earliest puppetry memory, barring Sesame Street, would have to be Captain Kangaroo's Mr. Moose and Bunny Rabbit. In fact, I think they might have predated SS for me. I also recall seeing Kukla Fran and Ollie, but not on their own show, just a clip of them on someone's variety show, in black and white. Not sure the year, but somewhere in there was a show called Gigglesnort Hotel that I adored as a child, although I don't have any specific memories of the puppets; I was instead captivated by the character of Bob the Blob, and this led me to my love of modelling clay and sculpting. There was also of course Mr. Roger's Neighborhood, although I pretty much ONLY watched it for the puppetry scenes in the Land of Make-Believe (and those wicked little dioramas of the LMB locations he kept in his kitchen, which no doubt sparked my love of detailed miniature environments). However, my friend Doug-- the one with the eidetic memory and huge IQ-- watched Mr. Rogers until we were in high school. He loved that show. When we got cable, I loved Nickelodeon, so I got a lot of new puppet shows that way. First with Pinwheel, which my neighbor Craig and I both watched religiously and would quote often. I remember thinking that Plus and Minus were Bert and Ernie ripoffs, but Craig and I loved Ebenezer T. Squint, and would mimic the Admiral Bird to annoy his older sister. Today's Special was another one we watched thanks to Nickelodeon. I can't recall much about any episodes, but the opening shots and theme song are burned in my brain. Yes, I remember 'Madame' too, mostly from Hollywood Squares but also from the occasional prime-time show or guest spot on talk shows. In fact, I recently made a post on here about how I think Madame might be one of Statler's ex-wives. Somehow, I never saw Great Space Coaster until the 90's, when a clip of Mark Hamill's appearance was included on a 'Star Wars Rarities' VHS that I bought; not surprisingly, that snippet appeared right after the Hamill Muppet Show on that same tape. It remains the only fragment of that show I've ever seen. "Mikey Hamster? Mick Jagger?!" Someone mentioned Zoobilee Zoo on here. I kinda think maybe I watched that one, but I always got the name confused with New Zoo Revue, so things get a little muddled in my memory. If there was a poem on Zoobilee Zoo about endangered animals, with a line about "two dodo birds forgot the words, so they just hummed along", then I was powerfully moved by that prose and have been searching in vain for it since like 1991! And Nickelodeon, since recategorized as Nick Jr., was also my introduction to Eureeka's Castle when I became an uncle around the time I went to college. My niece and nephews watched that show all the time. My Dad went to Nickelodeon Studios at Universal Studios Florida one time and had his picture made in front of the photo-op cutouts of Magellan, etc. just for the grandkids. In fact, it's the vivid memory of the logo in that photo which made me pretty sure there were three E's in Eureeka. I double-checked it before I typed it just now. Aside from all that, though, it was Sesame Street, The Muppet Show, Fraggle Rock. Those were the big three. I'm happy to report that I recently bought myself a vintage Grover puppet to replace the one that was lost in a move in 1975. My younger son played with it more than I did, because it fit his little 9-year-old arm better, so the torch is being passed. 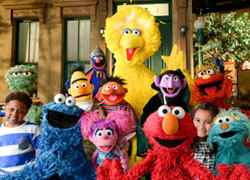 My older son is 12 and a half, but even he curled up on the sofa when we watched Sesame Street Spoofs tonight.